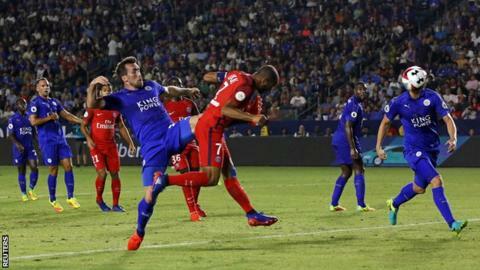 Premier League winners Leicester City suffered a 4-0 loss to French champions Paris St-Germain in the International Champions Cup in Los Angeles. Edison Cavani opened the scoring from the penalty spot on Saturday, with 18-year-old Jonathan Ikone doubling PSG's lead before half-time. Lucas Moura and teenager Odsonne Edouard completed the rout in the second half at the StubHubCenter. The Foxes face Barcelona next in the competition in Stockholm on Wednesday. Claudio Ranieri's side, who start their Premier League campaign at Hull City on 13 August, beat Celtic 6-5 on penalties in their first International Champions Cup game last week.